A telemarketer just called me to try to sell me on using a marketing automation product. Marketing automation products are predicated on the idea that email marketing is the best way to sell a product or service and, yet, they were using telemarketing to try to sell themselves to me. Seems like a pretty good ad for telemarketing, huh? Milwaukee, WI – We at Third Person just wanted to take a moment to congratulate our client PS Furniture for winning a prestigious gold award for their innovative Müm touchdown seating at NeoCon, the industry trade show for contract furniture. 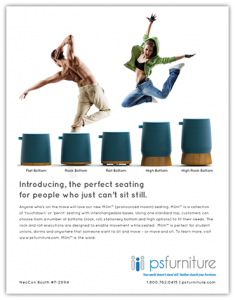 Third Person featured Müm in our most-recent ad for PS Furniture. Great work, guys. We’re thrilled to be even a small part of your growing success. Milwaukee, WI – To introduce PS Furniture‘s newest line of highly-movable furniture, Milwaukee advertising agency Third Person crafted this ad for their innovative new Müm (pronounced “moom”) touchdown seating. The ad uses young people in motion to help position Müm as the perfect furniture for the common spaces in College dorms, study nooks, and anywhere else people who tend to be on the move can take a moment to sit. Milwaukee, WI – Milwaukee-based advertising and web development company, Third Person, Inc, has just finished their latest television commercial for Batteries Plus Bulbs, the nation’s most successful battery and light bulb franchising company. The light-hearted package of :30, :15 and :10 TV spots promote Batteries Plus Bulbs growing device repair service.